Easter is less than two weeks away, and I’m getting so excited! We picked out Kate’s Easter basket a couple of weeks ago and she’s been carrying it around the house ever since. I love how much she gets into the traditions of the holidays! Last year Kate had fun with an Easter egg hunt at G’s parent’s house, and this year I think she’s really going to love it! As many of you know, I’m a bit of a nutrition nut so I wanted to think of some fun and sugar-free Easter egg filler ideas that Kate could enjoy sans cavities and sugar crashes. Here they are! 2. Stickers! Kate loves stickers so I bought a packet of Easter-themed stickers, and a packet of Cars-themed stickers (she’s super into cars and trucks right now) and cut them into egg-sized pieces. 3. Kids love money before ever understanding what money really is. Fill their Easter eggs with coins and they’ll be thrilled to fill up their piggy bank after the egg hunt! 4. Barrettes, bows, hair clips, ponytail holders–any kind of hair accessory your little girl is currently rocking these days! 5. Little toy cars! Kate is obsessed with cars right now, and loves her Little People Wheelies Rampway. 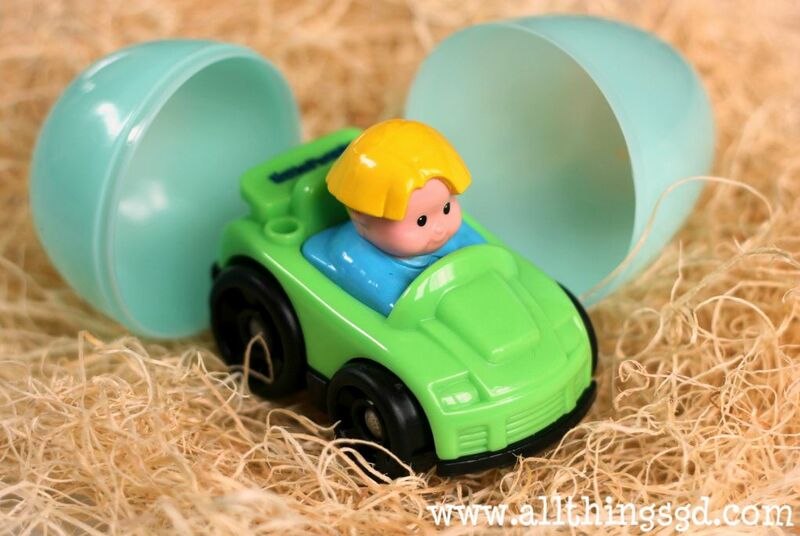 The little toy cars that go along with it (like this one found in the Easter section at Target) are excellent fillers for extra-large eggs. Matchbox cars are another great idea! Just make sure you get eggs that are large enough to hold them (or cars small enough to fit). 6. Sidewalk Chalk. Another recent find is sidewalk chalk in the shape of an egg in Target’s Dollar Spot section. I picked up four chalk eggs for $1! 7. Miniature Playdough. 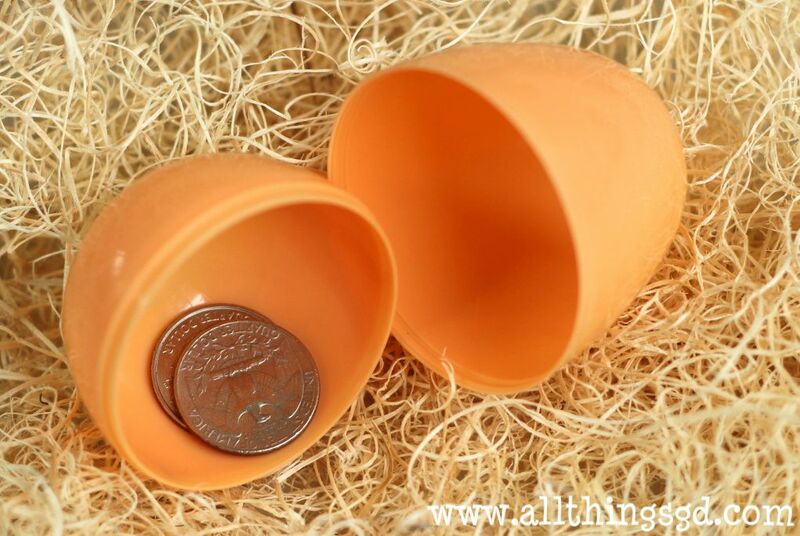 I’ve seen miniature playdough tubs in varying sizes so make sure you get eggs that are the right size to hold them. 8. Miniature bubbles. One of my favorite signs of Spring is seeing bubbles floating across our yard, compliments of the many playful children in our neighborhood. Look for miniature bottles of bubbles at any party store for just a handful of pennies! 9. Packets of planting seeds. Consider starting a new tradition with your child! Spring is the perfect time to give them packets of flower or vegetable seeds to plant, help water, and watch grow. 10. 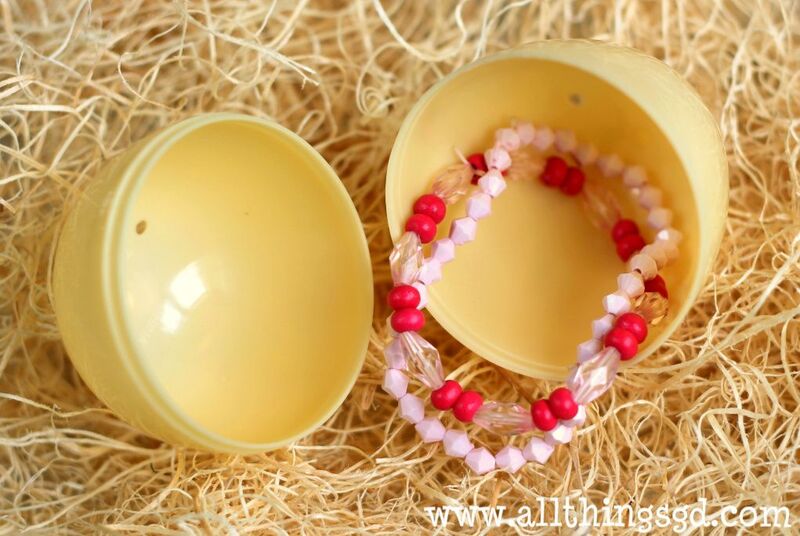 Kate is an accessories hoarder queen, so filling her Easter eggs with bracelets, necklaces, and plastic rings was an obvious choice! 11. They’re not just for stocking stuffers and school clothes shopping! 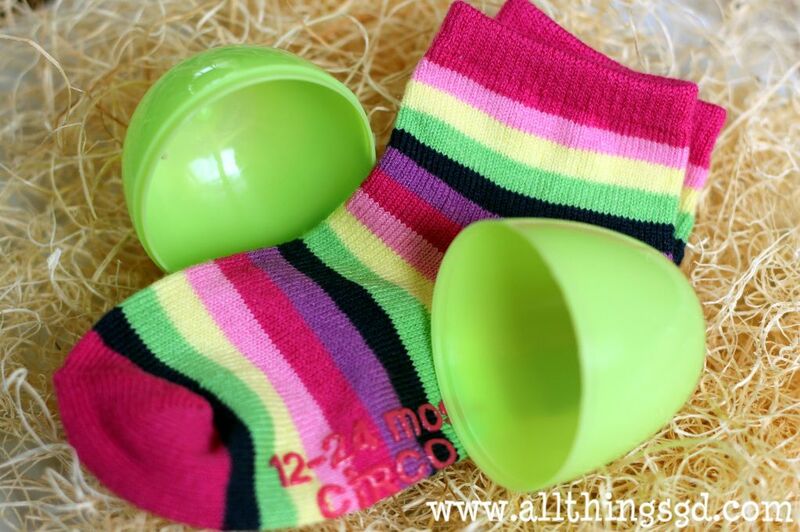 Filling your child’s Easter eggs with a pair of brightly colored socks is a fun way to sneak in these otherwise boring wardrobe necessities. 12. Balloons. Kate loves balloons, and they make a cheap and easy Easter egg filler. Blow them up and teach your little one how to play catch, or bat them in the air for your child’s first volleyball game! 13. Legos. A classic never goes out of style. Fill your child’s Easter eggs with additional pieces of their favorite Lego collection–or get a collection started for them! 14. Bath squirt toys. The possibilities are endless with these little suckers (and squirters). Look for them by the bagful in the bath section of your favorite store. 15. Alphabet magnets. Your child will be having so much fun hunting for more letters that they won’t even realize they’re learning, too! 16. Puzzle pieces. Buy an age appropriate puzzle for your child, fill each of their eggs with one of the pieces, and turn their Easter egg hunt into a search to find all the pieces to the puzzle! 17. I may be a Nutrition Nazi, but that doesn’t mean I’m a total wet blanket when it comes to snacks that Kate can enjoy. 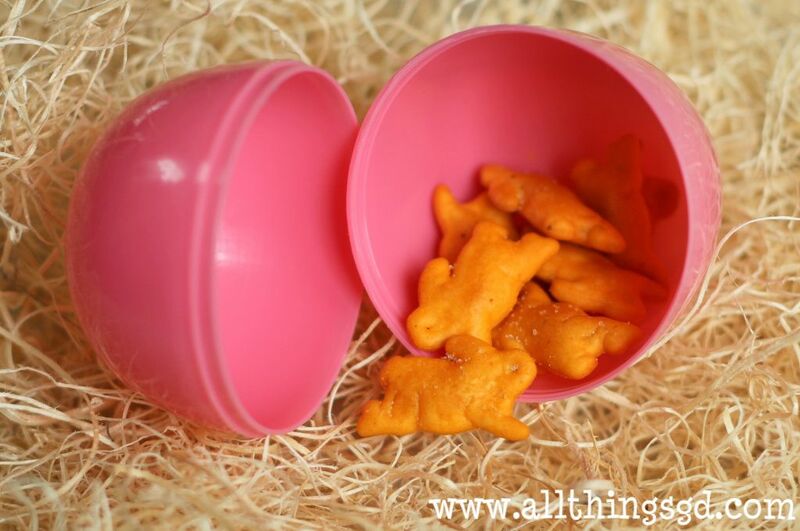 Annie’s Cheddar Bunnies are crackers in the shape of bunnies (perfect for Easter!) and made from organic, no sugar added ingredients. 18. Kate loves raisins, and a surprising recent discovery is that she also loves almonds and dried cranberries. 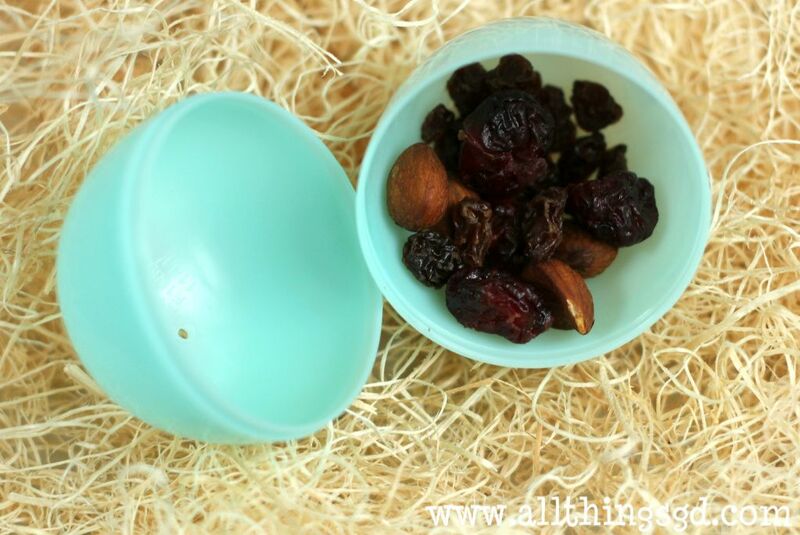 A homemade trail mix of the three makes a wonderfully healthy Easter snack! 19. Your child’s favorite cereal, such as Cheerios, Kix, or Chex. 20. Pretzels, such as Annie’s organic Pretzel Bunnies! 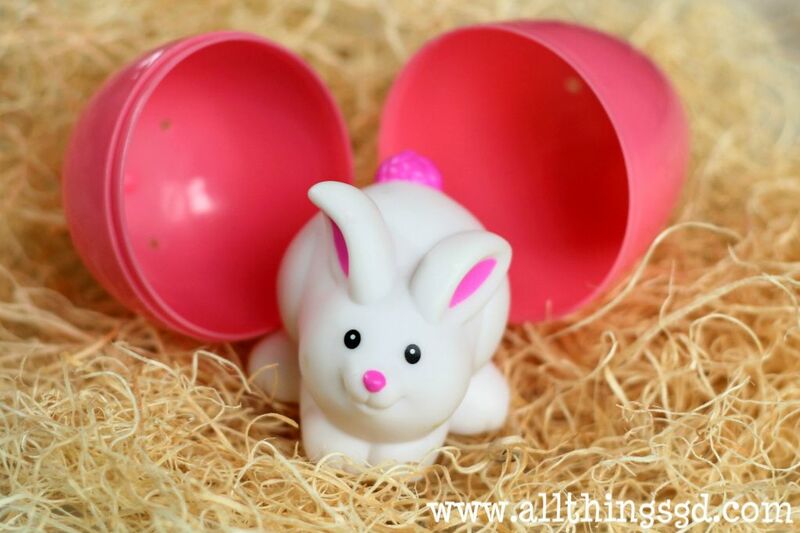 So there you have it–20 ideas for egg filler items you can feel good about treating your toddler with this Easter holiday! 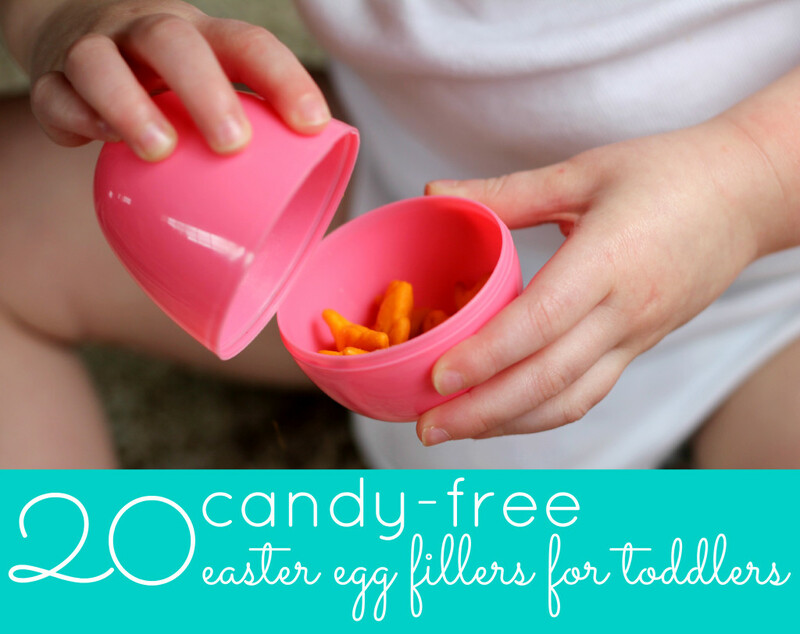 Got any other candy-free filler ideas you’d like to share? I’d love to hear them! Disclaimer: Please consider your child’s age and ability when choosing Easter egg fillers for him/her. Choking is a serious risk when it comes to objects this size, and anything that can fit inside of a small plastic Easter egg should be handled by your child only under strict adult supervision. These are great ideas and I’ll be stealing several for my 15 month old’s basket. Thanks! This is perfect, I was just thinking this morning I needed to look up some Easter egg stuffer ideas! So thanks This covers it! 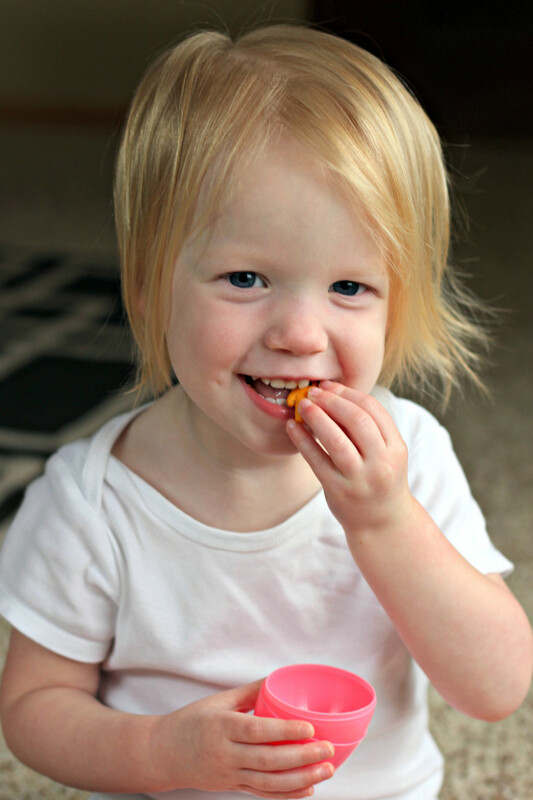 I am also big into nutrition for my 21 month old and we love the cheddar bunnies! I just found Easter Eggs at Target that were filled with Organic fruit snacks…we will be using those too! I have got to tell you, we are nutrition nazis. Our reasoning was that since we’ve had weight issues it was our gift to only allow healthy, whole foods in the house. We have done something wrong. My oldest is now 10 and he goes over people’s houses and to birthday parties solo. He eats himself sick EVERY TIME. Moderation is our new mantra. Sigh. We have been total nutrition nazis for the past 10 years. Now, my adorable tween eats himself sick every time he is at a friend’s house or party without me. Moderation is our new mantra. Sigh. What great ideas, thanks for sharing! I don’t have kids (but hopefully someday) but I love the idea of non-candy themed Easter basket! I’ll need this list next year! This year she’s getting board books and baby proofing items…ha. I will add that with the money, you should clorox wipe it…money is very dirty. @Jenna–I recently bought some Annie’s fruit snacks for Kate to enjoy during my Oscar party and she loved them! She’ll be excited to see them again in her Easter basket. And they’re also bunny shaped which is so cute! @Chicago Mom–I totally agree with allowing things in moderation. There will be some candy treats in Kate’s Easter basket too, but there’s certainly no shortage of candy-related egg filler ideas out there! Great ideas, Anne Marie–thank you! I hadn’t thought of seeds or bubbles- brilliant! Your pictures are great- I can never get small items to look good with my SLR camera. Happy early Easter! This is an amazing list! Thanks for sharing! @Alison–I don’t know much about photography to be honest, but I used my fixed 50mm lens for these pics, and I’m guessing that’s the difference. Search out “Canon 50mm 1.8” on Amazon.com to check it out! Can I possibly talk you out of using the term “Nazi” so flippantly? It cheapens the unbelievable atrocity exacted by a genocidal, totalitarian regime. There is nothing cute or quirky about using it in the context of being a little tough or strict. I don’t say this because I’m a Jew; I say this because I’m human. Please think about it? I agree completely. I detest the frequent flippant use of this word. Couldn’t agree more. Thanks for pointing out what I wanted to. Thank you so much for these ideas! @Elizabeth–That’s a great point and certainly one I hadn’t thought of. I’m always interested in learning and expanding my perspective–especially when it’s done in a respectful manner. Thank you for sharing. GOLD- my girls loved finding Gold. “Real gold, Mom!” The gold colored dollar coin was a big deal. Just one or two, was lots of fun. Also, bendy toys, plastic rings and necklaces, super balls, all the geegahs that kids love to choose at those pizza places. Age approp., of course. Love the idea of puzzle pieces. Wish I’d thought of that. Hi, I am doing this this year with my 3 year old. Last year we hid a couple eggs and that was all her attention span could handle. This year there will be lots of hidden eggs. I hadn’t thought of stickers or hair chips, thanks! Found you via Pinterest. Follow via Email now. @Ashley–Oh I bet she’ll totally be into it this year. Hope you have fun tomorrow! So happy to have you as a new follower; thank you! I just found this via pinterest, it’s a GREAT LIST! Yes to stickers! I’m also thinking bouncy balls for my 18 month old. On other blogs I’ve seen DIY molded crayons, that could work, too! I’m so excited to be making an Easter basket after so many years! I am going to buy a sarfari toob, I cam get them at AC Moore for $5 and they have 10-12 small animals in them. I will split up the animals and put them in the eggs. And we will do a few eggs with m&ms or a Hershey kiss, I like to mix it up. Thanks for the ideas. Last year we did two toobs, puzzle pieces to a 3d puzzle and some candy. This year we’re doing a toob, encased insects for light table, play doh in a larger egg, rory’s story cubes, some bubbles and whistles. The puzzle pieces really didn’t go over well last year (though he was only 2). I have twin infants so I want to minimize choking hazards but once that is not an issue, we will be doing playmobil sets, Legos or kid knex pieces. I wanted to mention a snafoo that I ran into last Easter. I bought plastic Easter eggs and filled them with animal crackers for the kids. (I wanted to avoid the super sweet candy treats) The eggs weren’t large enough for the mini packages of animal crackers so I had to place them in the eggs without the package. Apparently plastic eggs have a tiny hole in them, which I assume is there for the purpose of the molding process. This tiny hole, which I didn’t notice in advance, was large enough for ants to climb in and enjoy the crackers. They were only in the yard for maybe 1 hour before the egg hunt. So, word to wise… be sure to use treats that are sealed in separate packaging before you place them in a plastic egg and hide them outside. I did cookies too, and last year they were in the yard for an hour or two. Not ants, but a bigger animal like a squirrel, bit right through the plastic eggs, two of them! So many more great tips and ideas – thank you everyone! I love these! I don’t have children yet, but I’m 21 and I wouldn’t even mind finding some of these in an easter basket…lol! Since having kids I also do not like filling baskets or eggs with candy… other things I have done that can be added to your list include… STAMPS (as in stamps and stamp pads for pictures), underwear, baby sunglasses (fit in the large eggs), pool squish balls (great also for bath tubs and water tables), little pet shops, earrings (did this last yr for my 4 yr old), new pillowcase or wash cloth (I was amazed how I was able to fit these in the larger jumbo sized egg). I also like to put in temporary tattoos, those little growing wash clothsyou can get at the dollar store, the little growing sponge animals, bouncy balls, pencil toppers/erasers, we’ve also done math problems/ trivia questions for my older son with dollar store items as “prizes”that wouldn’t fit in eggs, silly putty, sugar free life savers, Lego mini figures, hot wheels cars & little boxes of raisins/yogurt covered raisins. Thanks for some more ideas. I’m loving all these wonderful ideas! Thanks everyone! I love doing coins. You could also do arcade coins. Then take the family to an arcade. Great added family time after a scavenger hunt. Wonderful ideas for a non-sugary Easter! We also cut apart tattoos and put them into eggs, the kids love tattoos! Thanks Cheri! Tattoos is another fun idea – thanks for sharing! I have to say that I love the seeds and the socks ideas. I have seen some of the other ideas before, but those were definitely new and things my DS will love! I love to hear that Melanie! Happy (almost) Easter! Last year I did a non-candy easter egg exchange with some friends. We each brought a dozen filled with one type of goody and left with a dozen assorted eggs. It was such a hit I’m doing it again this year, only I’ve found your site to direct people to when they are looking for ideas! I am doing 2 dozen this year, 1 of mini bubbles and one of baby washcloth bunnies (using baby washcloths from the dollar store). Thanks for the great visuals and the great round-up of ideas! This is such a great idea, Shelley! Thanks for sharing! 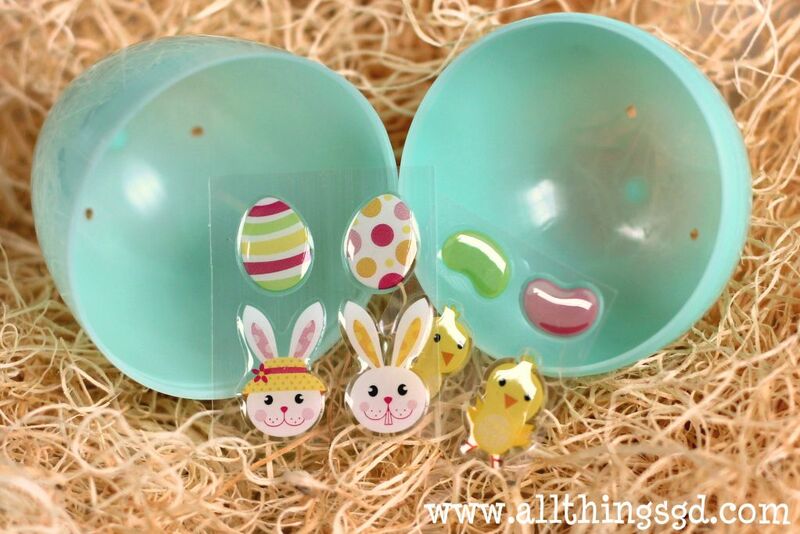 Last year my daughter was 18 months and I included easter themed finger puppets. My daughter still loves them. I love your ideas and will be using them this weekend! Ooh, finger puppets are a great addition – thanks Kathryn! Another neat idea – thank you Tiffany! Great ideas! I found this via Pinterest . We will be using lots of your ideas for my granddaughter this year. Michael’s craft store and Wal-Mart both carry animal shaped eggs. I get them for my niece and nephew every year. The dollar tree by me had bunny, carrot and chick shaped eggs. 3 for $1. hese are great ideas! 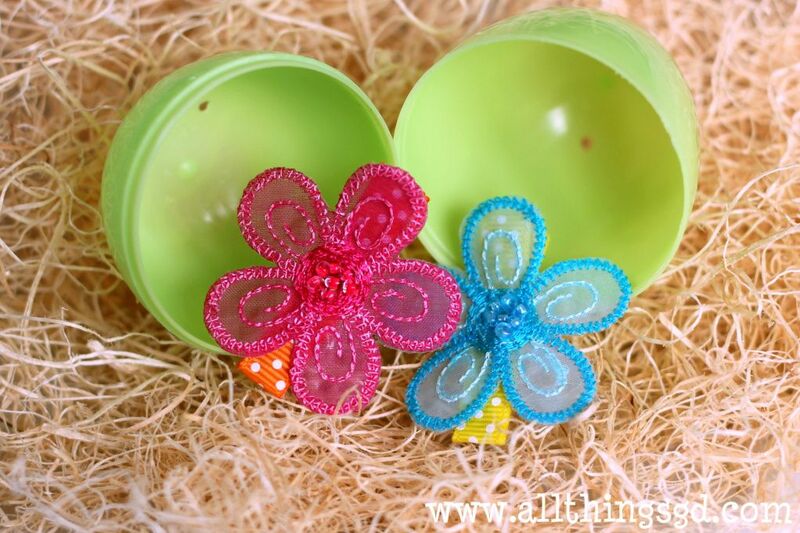 one more idea I had is mini bubbles if your child likes bubbles…you can usually find the mini bottles at the dollar store and I think they will fit in the eggs! Fantastic ideas!! Don’t know if this was posted yet, but my 18 month old loves the puff snacks. (They’re about as close as she gets to candy!!) There is a great selection of organic varieties. Can’t go wrong! Our granddaughters love nail gems, nail stickers and nail polish. We will be putting some in their Easter Eggs. Have a Happy Resurrection Day! Great ideas and thanks for the inspiration. Found this on Pinterest. Some good ideas, however, the safety of some of these ideas for toddlers is something that I have to stress. No one should ever give any child 4 and under balloons, jewelry with small parts, coins or small objects that they could easily choke on.